The Chamberlain Scholarship program honors Ralph E. Chamberlain, CFRE. Mr. Chamberlain had a long and distinguished career of service to the Association of Fundraising Professionals (AFP), beginning in the 1960s when the organization was formed as the National Society of Fund Raisers (NSFR), through the late 1970s when the name was changed to the National Society of Fund Raising Executives (NSFRE), and until his death in 1999. Mr. Chamberlain's dedication to the organization we now know as AFP never faltered in his long volunteer career with the Association. Because of his long-time support of the Foundation's annual fund and generous planned gift, the AFP Board of Directors renamed their Conference Scholar Program in 2000 to honor Mr. Chamberlain's memory and commitment to the Association. The scholarship covers the Chamberlain registration and up to $1,000 in travel or lodging expenses. 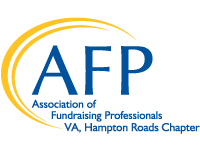 Applicants must have a current AFP Hampton Roads membership in good standing. Candidate must be currently employed by a non-profit and have worked in the development profession for at least three years. Candidate will not have previously attended an AFP (or NSFRE) International Conference on Fundraising as a registered participant (unless as a member of the Conference Host Committee). Candidate is responsible for making all travel and lodging arrangements and agrees to pay $10 to register for the conference. Candidate will also agree to serve on an AFP-HR committee for one year following their return from the International Conference. The candidate also will complete and return an Evaluation Form about his or her experience to the Scholarship Committee. Application Deadline: Friday, September 21 by 5 PM. Please submit completed application to Homer Babbitt, Scholarship Chair.